In this Sunday, Feb. 15, 2015 file photo, Paige Butcher, left, and Eddie Murphy attend the SNL 40th Anniversary Special at Rockefeller Plaza in New York. The couple is expecting their second child together. Eddie Murphy, the 57-year-old actor, is going to be a dad times 10 this year as his girlfriend Paige Butcher is expecting their second child together. "Eddie Murphy and longtime girlfriend Paige Butcher are pleased to announce that they are expecting their second child in December," a rep for Murphy confirmed in a statement to People. The announcement comes on the heels of recent sightings of Butcher with a visible baby bump. In 2016, the longtime couple welcomed their first child together, daughter Izzy Oona Murphy. She was also the first child for Butcher. Murphy is no stranger to fatherhood. He is a dad to five kids with his ex-wife, Nicole Mitchell Murphy. They share four daughters--Bria, 28, Shayne, 23, Zola, 18, Bella, 16--and son Miles, 25. 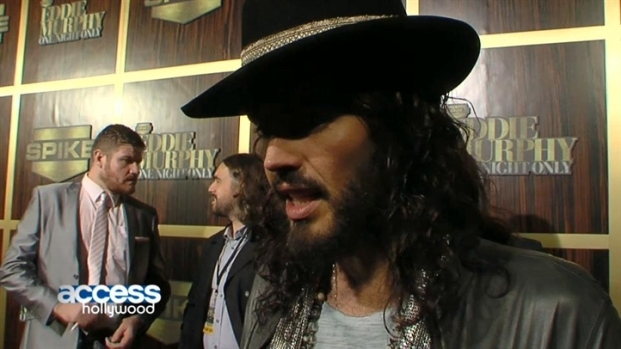 Russell Brand explains how Murphy has influenced his career while attending Spike TV's "Eddie Murphy: One Night Only" event. "I'm in a relationship with a celebrity, so I felt like there's already enough of me out there," Butcher told Vanity Fair in 2013. "I felt like I was giving out too much information. I was giving people too much access. I like to keep as much private as possible now."